For the bay in New Guinea known as Humboldt Bay from 1827 to 1968, see Yos Sudarso Bay. Elk River; Jacoby, Freshwater, and Salmon Creeks. 1852 U.S. Coast Survey map of Humboldt Bay. Humboldt Bay is the only deep water bay between the San Francisco Bay and Coos Bay, Oregon, and the Port of Humboldt Bay is the only protected deep water port for large ocean-going vessels for the large region. Despite being the only protected harbor along nearly 500 miles (800 km) of coastline, the bay's location was undiscovered or at least unreliably charted for centuries after the first arrival of European explorers to the Pacific Coast. This is partially because it is difficult to see from the ocean. The harbor opens to the sea through a narrow and historically treacherous passage, which was blocked from direct view because of sandbars, which are now managed by jetties. Contributing to its isolation were features of the coastal mountain range which extends from the ocean approximately 150 miles (240 km) inland and the common marine layer (fog) in addition to frequent clouds or rain. View of the Middle Channel of Humboldt Bay and Indian Island taken on Woodley Island. Note the Memorial to lost fisherman in the foreground. Early explorers including Francis Drake, Sebastián Vizcaíno, Juan Francisco de la Bodega y Quadra, and George Vancouver, did not discover the bay because of a combination of circumstances: the situation of the opening to the ocean, storms, and fog. Captain Jonathan Winship is credited with the first recorded entry into Humboldt Bay by sea in June 1806 while employed by the Russian-American Company. His party, including Aleuts in baidarka to hunt sea otter, were met with hostility by the local Indians. Winship's party named it Bay of Resanof, after Nikolai Rezanov, the Chamberlain of the Tsar, and son-in-law of Grigory Shelikhov who was the founder of the first Russian colony in America. In 1849, an expedition of seven men led by Josiah Gregg attempted to find an overland route to the Pacific Ocean. They left from the gold town of Weaverville for the 150-mile trek to the sea. Because of the density of the redwood forests, and because Gregg stopped frequently to measure latitude and the size of the trees, the expedition averaged only two miles per day. The party was near starvation when they emerged on the coast, where they discovered what is now known as Humboldt Bay on 20 December 1849. After stocking up on food, the party walked to San Francisco to report their discovery of the bay. In March 1850, two ships, the General Morgan and the Laura Virginia, were sent to the bay from San Francisco. After considerable initial difficulty with waves breaking heavily over shifting sands of the bar crossing,  the ships entered the bay in 1850. The members of the Laura Virginia company named the bay after Alexander von Humboldt, a noted German naturalist. The local Native American name for the bay was Qual-a-wa-loo,  while the Wiyot nation called it "Wike" or "Wiki". Indian Island is a National Historic Landmark and one of the sites of the 1860 Wiyot Massacre. After two years of white settlement on Humboldt Bay in 1852, only six ships sailed from the bay to San Francisco, but by 1853, on the same route, 143 ships loaded with lumber crossed the bar. Of those, despite the best efforts of local pilots and tugs, 12 ships wrecked on the bar; in times of bad weather, ships could remain in harbor for weeks before attempting the crossing. The first marker at the harbor entrance was placed in 1853. The U.S. Federal Government authorized funds for a lighthouse near the mouth. In 1856 the Humboldt Harbor Light was built on the north spit. In 1872 a bell boat was added, and two years later, a steam whistle replaced the bell to assist mariners during times of dense fog. Eighty-one people drowned between 1853 and 1880 during bar crossings, including the captain of the brig Crimea who was washed overboard on the bar crossing on 18 February 1870. The Humboldt Bay Life-Saving Station is on the bay side of the North Spit south of the World War II era blimp base. One of the 4,796 dolosse made on the South Spit for use on the south and north jetties protecting the mouth of Humboldt Bay. The only one not in the jetties is on display in front of the Eureka Chamber of Commerce. Most of the large sloughs around the bay have protected with levees. Of the 10,000 acres (40 km2) of historic intertidal marsh, only about 10% remains because of land reclamation for hay or pasture, as well as the construction of the Northwestern Pacific Railroad in 1901, which reduced tidal connectivity along the eastern edge of the bay. The bay has been invaded by the European green crab, a voracious predator that is known to prey on the young of native crab species, as well as native mussels, oysters, and clams. European green crab were first documented in Humboldt Bay in 1995 and have been blamed for a decline in clam harvesting. Easterly view from the docks of Eureka's Woodley Island Marina. Carson Mansion at dusk, with distant view of California Coast Ranges due east of the populated Humboldt Bay area. Northerly view from Woodley Island of Monterey cypress trees on Indian Island, the largest of three islands, all of which are in the Eureka City limits. The great egret nests in these trees in large numbers each year. About 80,000 people reside on the shore of the bay in at least 20 named settlements on the coastal plain around the bay estuary; most of these are unincorporated suburbs of the City of Eureka. Southerly view of Eureka Slough (left and midsection, larger stream), Freshwater Slough (right-mid portion, larger stream); and when photo is expanded Freshwater Creek (background and left near treeline), Ryan Slough (mid-upper top portion), Ryan Creek (furthest top midsection and barely visible when photo is expanded). Location is South of Highway 101 at the northern edge of the city of Eureka. Humboldt Bay Harbor Recreation and Conservation District is the governing body of Humboldt Bay, the Port of Humboldt Bay, and the Port of Eureka. Maritime pilots trained and employed by the district are the only persons authorized to bring vessels beyond a certain size into the bay unless the ship's pilot has proper certification because despite the jetties and dredging, the harbor entrance remains challenging. The district maintains a 237 berth marina at Woodley Island, serving both recreational and commercial boats and a shipping dock located in South Bay. California State Route 255 – only bay crossing and sole access to the Woodley Island Marina. ^ Shellfish Growing Area Classification for Humboldt Bay Technical Report # 06-11 (PDF). California Department of Health Services. March 2006. p. 87. Archived from the original (PDF) on 14 September 2012. Retrieved 13 December 2013. ^ "Humboldt Harbor Historical District". Office of Historic Preservation, California State Parks. Retrieved 2012-10-07. ^ "Humboldt Bay Management Plan Executive Summary" (PDF). Humboldt Bay Harbor Recreation and Conservation District. May 2007. Archived from the original (PDF) on 24 February 2012. Retrieved 13 December 2012. ^ a b c d e f g h Costa, Steven L.; Karen A. Glatzel (September 2002). 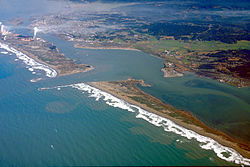 "Coastal Inlets Research Program: Humboldt Bay, California Entrance Channel, Report 1: Data Review" (PDF). U.S. Army Corps of Engineers. Retrieved 13 December 2012. ^ a b c d e f g h i j k l m n o p q Schlosser, Susan; Annie Eicher (2012). Humboldt Bay and Eel River Estuary Benthic Habitat Project (PDF). University of California San Diego: California Sea Grant College Program Publication No. T -075. p. 246. Archived from the original (PDF) on 2 April 2015. Retrieved 13 December 2009. ^ "Draft Transit Dev Plan Humboldt County Systems". PMC/HDR. December 2011. Retrieved 23 August 2013. ^ "Humboldt Bay Sea Level Rise Adaptation Plan" (PDF). California Coastal Commission. 2012. Retrieved August 23, 2013. ^ "WHSRN Humboldt Bay Complex". Western Hemisphere Shorebird Reserve Network . 2009. Retrieved August 23, 2013. ^ Pomeroy, Caroline; Cynthia J. Thomson; Melissa M. Stevens (August 2010). California's North Coast Fishing Communities Historical Perspective and Recent Trends: Eureka Fishing Community Profile (PDF). National Oceans and Atmospheres Administration California Sea Grant Program. p. 79. Retrieved 9 December 2012. ^ a b Hills, Cody (6 December 2012). "Backyard of Boats". North Coast Journal, Eureka, California. Retrieved 6 January 2013. ^ Li, Wenhao (1992). The late Holocene stratigraphy of the Eel River delta. in: G.A. Carver and K.R. Aalto, eds., Field guide to the late Cenozoic subduction tectonics and sedimentation of northern coastal California. GB-71. Pacific section. American Association of Petroleum Geologists. pp. 55–57. ^ a b c d Davidson, George (10 March 1891). The discovery of Humboldt Bay, California. Geographical Society of the Pacific. p. 16. Retrieved 9 December 2012. ^ Planwest Partners Inc.; The Cultural Resources Facility Center for Indian Community Development, Humboldt State University (October 2008). Humboldt Bay Historical and Cultural Resource Characterization and Roundtable. NOAA Coastal Services Center. p. 164. ^ Turner, Dennis W.; Turner, Gloria H. (2010). Place Names of Humboldt County, California (2nd ed.). Orangevale, CA: Dennis W. & Gloria H. Turner. p. 250 of 304. ISBN 978-0-9629617-2-4. ^ Rumsey, David (1852). "Preliminary survey of Humboldt Bay, California. U.S. Coast Survey. A.D. Bache". David Rumsey Map Collection. U.S. Coast Survey. Retrieved 1 January 2013. ^ a b c d e f g h i j k l m n O'Hara, Susan Pritchard; Gregory Graves (21 August 1991). Saving California's Coast: Army Engineers at Oceanside and Humboldt Bay. The Arthur H. Clark Company. p. 277. 978-0870622014. ^ a b c d e Bottin, Robert R., Jr.; William S. Appleton (August 1997). Periodic Inspection of Humboldt Bay Jetties, Eureka, California. San Francisco: U.S. Army Engineer Waterways Experiment Station, U.S. Army Corps of Engineers. p. 54. Retrieved 1 January 2013. ^ Tuttle, D.C. (1 January 2007). History of major developments on Humboldt Bay. in: S.C. Schlosser and R. Rasmussen, eds., Current Perspectives on the Physical and Biological Processes of Humboldt Bay, March 15, 2004. University of California, San Diego: California Sea Grant College Program, La Jolla CA. Publication No. T-063. p. 274. Retrieved 13 December 2012. ^ Tuttle, D.C. (26 March 1982). The history of erosion at King Salmon-Buhne Point from 1854 to 1982. Eureka, California: Proceedings of the Humboldt Bay Symposium:. pp. 32–38. Retrieved 13 December 2009. ^ "Humboldt Bay: Physical Geography". Nature and Science. Friends of the Dunes. Archived from the original on 30 November 2012. Retrieved 14 December 2012. ^ "KRIS Humboldt Bay". Klamath Resource Information System. Retrieved 14 December 2012. ^ Malovos, Andrew (1973). Marine Disasters Off The Humboldt Coastline and In The Vicinity Of Humboldt Bay. Arcata, California: Humboldt State University. pp. Pages 10–34, 40–104.